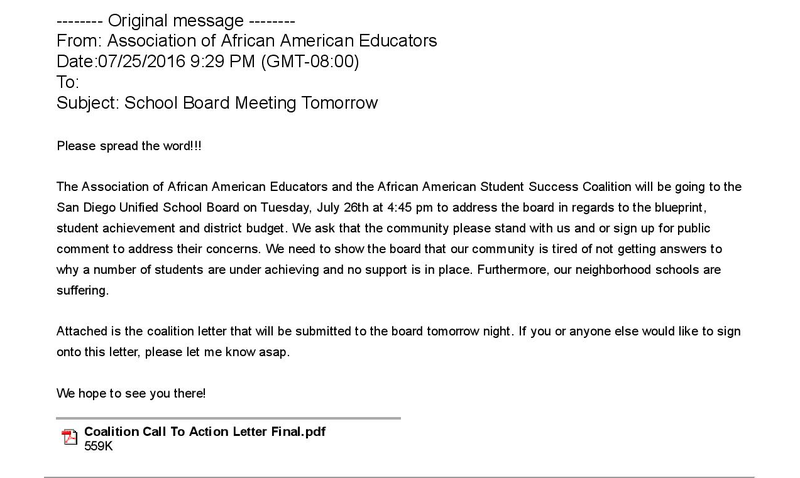 Association of African American Educators and the African American Student Success Coalition DEMAND PROMISED SDUSD Board Action! According to an email and Letter to District Deeds, it is obvious that the commitment to implement the “Blueprint to Accelerate the Achievement of African American/African Students” has been ignored by the San Diego Unified School District Board (Trustees Richard Barrera, Kevin Beiser, Sharon Whitehurst-Payne, John Lee Evans and Mike McQuary and Superintendent Cindy Marten) so a NEW Coalition has been formed to address this travesty. The AAAE has been in partnership with the San Diego Unified School District for the past six years working to develop implementation strategies for the Blueprint– Policies and Procedures; Graduation Rate; Gender-Specific Needs; and Parent/Family Support. District Deeds STRONGLY Urges ALL San Diego Unified Stakeholders to attend the board meeting TONIGHT to lend your voice and your support to the DEMANDS of the AAAE/AASCC for the good of our San Diego Unified community and especially for the benefit of our African American Students!! !